Home Wellness	How do you draw a line between business and family as a working parent? How do you draw a line between business and family as a working parent? I was recently invited to present as a guest speaker in an Auburn University class. It was a really fun experience and something I wished I’d had access to as a student. The class topic is Freelancing for Creative Careers, which covers many different angles of what it’s like to steer your own ship when it comes to a DIY career. As a working parent, I was asked about how I make it all happen and I just kept thinking, wow this class is such a treasure! I mean, what freelancer wouldn’t have loved a class like this with access to the basic questions we all have from time to time? Sometimes we are so quick to get “educated” we gloss over the basics and really miss some important learning opportunities. I’m a firm believer in asking all the questions whether big or small, simple or complex. You don’t know until you ask right? The students had some incredible questions, so I decided to answer them here in a new series called, #FreelancerBasics! It will be a personal reflection on real life as a freelancer. I’ll mention some tools and business stuff from time to time, but I don’t plan to focus on that as much since freelancers come in all different shapes, sizes, and industries. Freelancer Basics is a look into my life as a work-from-home woman and mother. I’ll be answering questions weekly so if you have one, send an email to andrea@justisafourletterword.com and let’s do this! 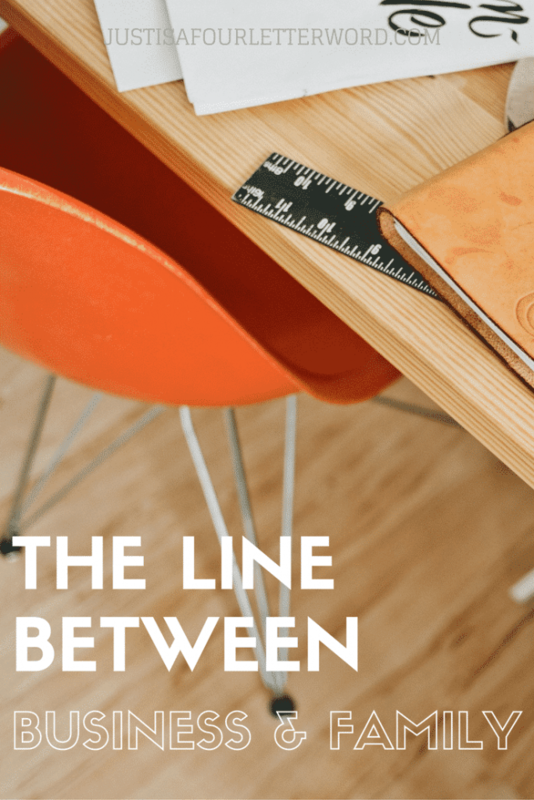 Do you ever feel like you need to draw a line between your family life and your business life or do you like them overlapping? I’m fresh off a work conference so I thought today was a good time to answer this question. I think before starting a family, I had grand ideas about leaving my work at work. In fact, I’ve always been pretty good and turning my brain off once I left the office. Now that I work from home, however, it’s much more challenging to draw that line. Especially as I look around all of the things that need to get done around the home, or run out to pick the boys up from school right after a conference call. Yes, there is a line between family and business. But it’s not a straight line like I thought it would be. It’s much more jagged. The truth is, some days are more clear cut but that’s the exception more than the rule. As a working parent, it’s going to be necessary to find ways to work in small chunks of time. You won’t be able to wait until you can devote two hours to a project. It may need to happen 15-20 minutes at a time. The key is to remember that even though progress may look different than it used to before having a family, it’s still progress. If you have goals and plan ahead for how you will make them happen, they will happen. Creativity is essential to this lifestyle so it’s less about keeping everything separate and more figuring out how all the pieces of your life can work together. It has been my goal since I was pregnant to stay home with the boys and for the boys even after they started school. That said, it wasn’t realistic to think I wouldn’t work and I actually enjoy having a job so I spent a lot of time figuring out how I could make this happen. I took odd jobs as a blogger here and there when my boys were babies and I could find time during naps or early in the morning or after bedtime. Then as they started preschool, I was able to work part-time remotely and now that they are both in Elementary school, I increased my hours to full-time. But that’s the story today, after almost eight years away from a traditional office setting. It took time, planning and patience to get here and some days it’s quite challenging. That said, I wouldn’t change it at all. I love having the flexibility to walk this bendy road with my family using the skills I learned in school and through my experiences to make a contribution. Freelancing is not for the faint of heart, but it’s very rewarding overall. Finally, I want to clarify something about the popular perception of “having it all”. In some ways, I do think I have the best of both worlds. But in most cases, it’s a lot like hopscotch. I have a little bit of this one day and hop to something else the next day. I don’t have it all at the same time and there are always trade-offs. Tough choices will have to be made at some point and I realize that I can’t be everywhere at once. This is the slow burn of a freelance career. It’s exciting and hard and valuable. I’m very close to my family and ask their feedback often. I also would be nowhere without my husband’s amazing support and contribution to the daily responsibilities we all have. Yes, I am a working parent and so is my husband. Our careers really are a team effort and that makes all the difference! Does your line between business and family look like mine or are you making it work another way? I’d love to hear your tips. Share in the comments below! Like this post? Share the love using the social buttons at the top and thanks for reading! Thank you for relating! Some days are definitely crazier than others but we just have to be like Dory and keep swimming, right?